Students observe the random movement of particles in air. Brownian motion is named after the botanist Robert Brown and describes the apparent random movement of particles suspended in a liquid or a gas. In 1827, Brown observed the jittery motion of small particles when looked at through a microscope. The movement was named Brownian motion but did not understand fully why it occurred. The movement of the small particles was due to molecules of water hitting them. Because the molecules were not visible, it seemed that the larger visible particles were moving on their own. These water molecules move around randomly and continuously as do gas molecules. Schools have for many years demonstrated the principles of Brownian motion using what is known as a smoke cell. These cells consist of a lamp and lens which is placed on the stage of a microscope. A small amount of smoke is piped into the glass cell and the movements of the smoke particles are observed. Students should be able to clearly see the random movement of the smoke particles cause by air molecules hitting them. A 'flexcam' or microscope camera can be used with projector or television if this is being conducted as a demonstration. The cells may need cleaning regularly because the smoke may stain the cell. 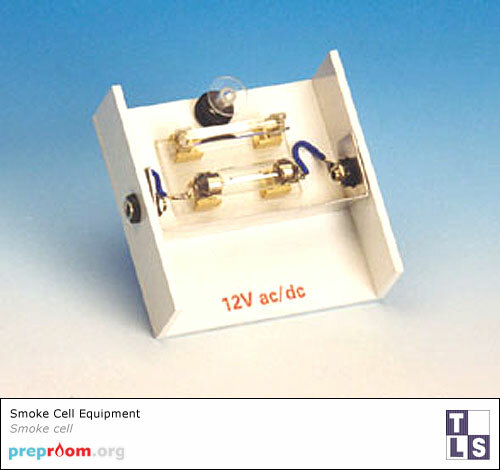 Smoke cells very in design but most have a thin glass lid on the cell much like a cover slip. This can be removed and cleaned. It is important to keep the cell clean as through a microscope, small amounts of grime may block light getting through to the viewer. 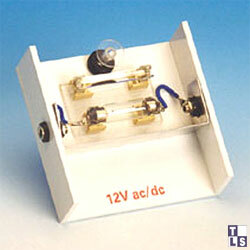 Lamps are usually 12v festoon types, which are easily replaced but should last for several years if handled sensibly. The lamp illuminates the particles from the side so they are visible through the microscope.